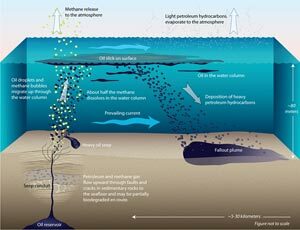 As much as one half of the oil that enters the coastal environment comes from natural seeps of oil and natural gas. These geologic features are known to occur in clusters around the world, such as off the southern coast of California and in the Gulf of Mexico, but are still relatively unstudied. In recent years, advances in remote sensing have enabled more accurate detection and estimates of natural oil flows in the ocean. In locations where seeps are found, oil flows slowly up through networks of cracks, forming springs of hydrocarbons similar to the La Brae tar pits on land. Lighter compounds rise buoyantly to the water’s surface and evaporate or become entrained in ocean currents; others fall to the seafloor and collect over hundreds or thousands of years. Seeps are often found in places where oil and gas extraction activities are also located. As a result, many surface slicks and tar balls caused by seeps are often attributed to releases from oil and gas platforms. The question arises, then: If oil occurs naturally in the ocean and if seeps are the biggest single source, why is there concern about the occasional accidental spill? The answer lies in the nature and rates of oil inputs by these different sources. Seeps are generally very old and flow at a very low rate. The material that flows out is still very often toxic, but organisms some that live nearby are adapted to conditions in and around seeps. A few very unique species of animals are even able to use the hydrocarbons and other chemicals released at seeps as a source of metabolic energy. In addition, rather than being made up entirely crude oil, the material flowing from seeps is often heavily biodegraded by microbial action deep beneath the seafloor. In contrast, the production, transportation, and consumption of oil by humans generally results in relatively short, high-volume inputs of oil and refined hydrocarbon products in places that have never experienced significant exposure to these chemicals and so do not have many natural defenses to them. As a result, seeps are often looked upon as a living laboratory for scientists to study how natural processes affect the fate of released oil or how individual species or communities of plants and animals are capable of dealing with the burden of otherwise toxic chemicals. From this may one day come a better understanding of how to help places affected by oil spills recover and regain much of their pre-spill health and function. Erupting oil paved the seafloor with mysterious mounds. Oil naturally leaking into the ocean offers a 'laboratory' to study accidential spills. Research study seeps off the coast of California. Dave Valentine and his scuba-diving team at the University of California Santa Barbara collected oil leaking from a seafloor seep. The white material clinging to the seafloor is made of filamentous microbes that probably use the oil as food. An audio slideshow: Join scientists as they discover that mysterious mounds on the seafloor near Santa Barbara, Calif., are the remnants of ancient asphalt volcanoes. And read an interview with them. Study off Santa Barbara is first to quantify oil in sediments.